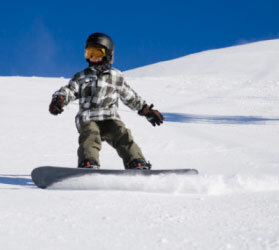 Is your little one tearing up the slopes and ready to hit the terrain park? Sierra at Tahoe is offering a kid friendly mini comp sponsored by Burton Snowboards. Behold! The Burton Riglet Park Snowboard Games. Perfect for your little Shaun White or Tara Dakides. Using Burton’s tried-and-true Riglet Technology, snowboarders can experience the excitement of competition just like their favorite Olympians! This free and fun event will teach kids 6 and under how to limbo and ollie, navigate through the gates, ride through the mini pipe, and catch (mini) air in the slopestyle course. Kids get to feel like a champion while proudly stepping on the podium and snapping a photo with their earned Riglet Medal! On February 9th, 2014 from 10:00am to 2:00pm all snowboarders 6 years of age and under can join in on this free event. Join us at the Sierra base area for this fun and entertaining kids comp. Have You Seen the Secretive Snowshoe Hare? After spending significant time in the Lake Tahoe area, we have been lucky enough to see the elusive snowshoe hare. In-fact a long stint in the North Shore area allowed us to deem one of these furry little creatures ours. On occasion we would be graced by the presence of a sweet little white bunny. Adorable and very friendly this little rabbit would make evening visits to our back deck. While we enjoyed and looked forward to these visits, we didn’t know just how lucky we were! Despite thousands of visitors to the Lake Tahoe area every year, many never catch a glimpse of the snowshoe hare. This small, nocturnal and super camouflaged bunny can be found throughout the Sierra Nevada Mountains. Reports of this magical snow rabbit began in the 1940’s on the Nevada side of the lake and have since been documented in many location around the lake. Join the Madroña Vineyards Winemaker for a special luncheon at Sierra at Tahoe. Take part in the spectacular lunch where you can take in the unparalleled views, delicious foods, and unique varietal pairings. Madroña Vineyards are located off of highway 50 in the heart of Apple Hill. Madroña’s exceptional mountain elevation vineyards offer perfect growing conditions for the wide range of Rhône and Bordeaux varietals. The ultra-rich soils and mild temperatures offer a perfect foundation for this unique estate grown and bottled wines. The Madroña Vineyard Luncheon is $20.00; lunch and wine pairings are included in the price, a valid lift ticket or season pass is required. Ages 21+ only. Want to learn about ski-area management? Are you interested in learning more about the forest service in South lake Tahoe? How about just getting a private tour of Heavenly Ski Resort? Well then these “Ski with a Ranger tours” are just for you! The perfect combo of history, maintenance and entertainment, these tours provide information on the Forest Service’s role in ski-area management, improve understanding of natural resource issues and promote environmental stewardship. Information on how the Lake Tahoe basin formed, its early inhabitants, types of trees and prescribed fires. The U.S. Forest Service conservation education staff will be leading “Ski with a Ranger” tours beginning Jan. 17 at Heavenly Mountain Resort in South Lake Tahoe. Tours will be an hour long ski trip, beginning at the top of the gondola Monday through Friday at 10:00 AM and 1:00 PM, weather permitting. All skiers skilled intermediate and above with a Heavenly lift pass are welcome to join this tour for free. Participation is on a first-come, first-served basis with no reservations required. The program will continue through April 11, weather permitting.